Hiu Sing Fan, age 16, was born in Hong Kong. He started violin playing when he was four. 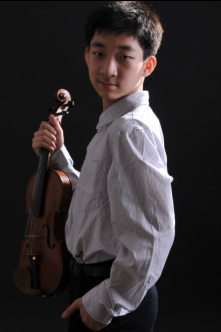 At age six, he won the first prize at the Hong Kong National Violin Competition. At age eight, he became the youngest student ever to attend China Central Conservatory of Music in Beijing. In 2005, he won the first prize at the Singapore International violin competition. Hiu Sing has won numerous competitions including the American Protégé International Talent Music Competition, Adelphi Chamber Orchestra Concerto Competition, and the New York International Artists Association Violin Competition. He has also given many successful recitals at Norman S. Benzaquen Hall at the Dimenna Center for Classical Music, the Lincoln Center, and the Carnegie Hall. Currently, Hiu Sing is studying with Prof. Stephen Clapp in the Juilliard School Pre-College Division and has been since 2009.